The “Popping Cupcake”, an explosion of fun for all Peta Zetas® lovers. Thousands of children had an explosive fun time this weekend with the “popping cupcake” activity that took place in the Peta Zetas® booth at the “Supers Party” event. The “popping cupcake” is a simple recipe, just a cupcake, chocolate syrup and Peta Zetas®, that offers children the funniest explosive afternoon snack. 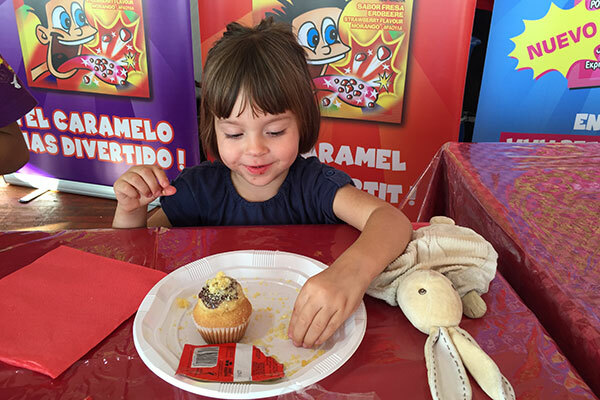 Parents and kids enjoyed this activity, that shows that Peta Zetas® is the funniest candy as well as the most explosive and innovative ingredient for afternoon snacks, ice-creams, yogurts and birthday cakes. The “Supers Party” event exceeded all expectations of attendance since over 350.000 people gathered in Montjuic (Barcelona) to celebrate the event´s 18th edition. The loyal fans of “Super 3 Club” were the main actors of the party, participating in over 50 music, dance and magic shows, as well as 150 activities organized by sponsors like Peta Zetas® that provided fun for children and parents.